Quinns: When I’m teaching games, I always start with a thematic sales pitch. “We’re terrifying wizards out to prove ourselves,” I might tease. “We’re nasty, competitive park planners.” “We’re Scottish lairds exploring our very own island!” It’s a fun way to get people excited and offer a handle on what’s about to happen. Thank goodness, then, Through the Desert speaks for itself the moment you start playing. This game is absolutely phenomenal. With the fabulous new edition, it’s hard to imagine a simpler, more satisfying, prettier game. That’s what the board looks like at the start of Reiner Knizia’s Thirsty Twerps. A wet, peaceful desert full of lush oases that everyone can slurp from (marked by palm trees) and pocked with little pond tiles that only one person can drink from. 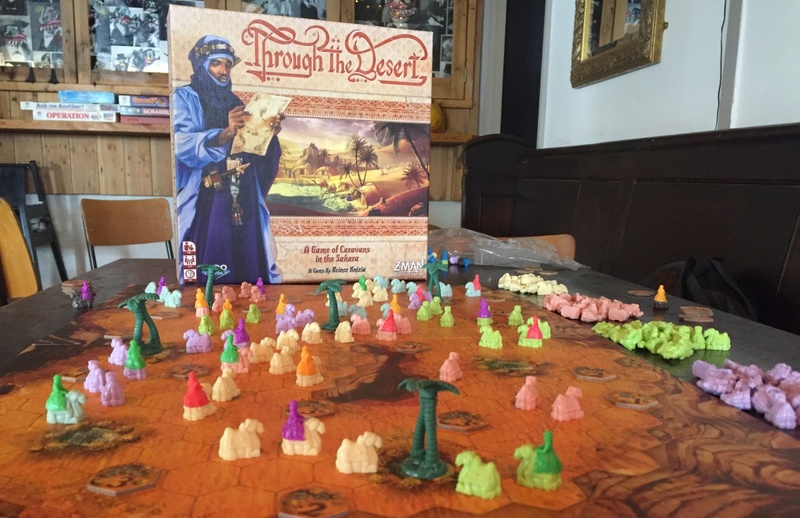 Instantly, the desert feels crowded, and it’s only going to get worse as players start deploying a nightmarish quantity of camels like big, bumpy barriers. Playing the game couldn’t be simpler. On your turn you extend any of your five caravans by attaching two camels of their colour. If you manage to connect your caravan to a new oasis, great! That’s five points. If you manage to stretch your caravan onto a pond, that’s just dandy. You pick up the token which might be worth one, two or three points. But wait! There’s more! If you manage to totally wall off a segment of the board with no other caravans inside it, usually by drawing a semi-circle against one of the board’s edges, you claim all of its water AND get one point for every empty space inside it, which is amazingly human. Congratulations! All those acres of sterile sand are yours and yours alone. So initially, Thirsty Twerps is thrilling because the points flow like rain upon your point-starved soul. 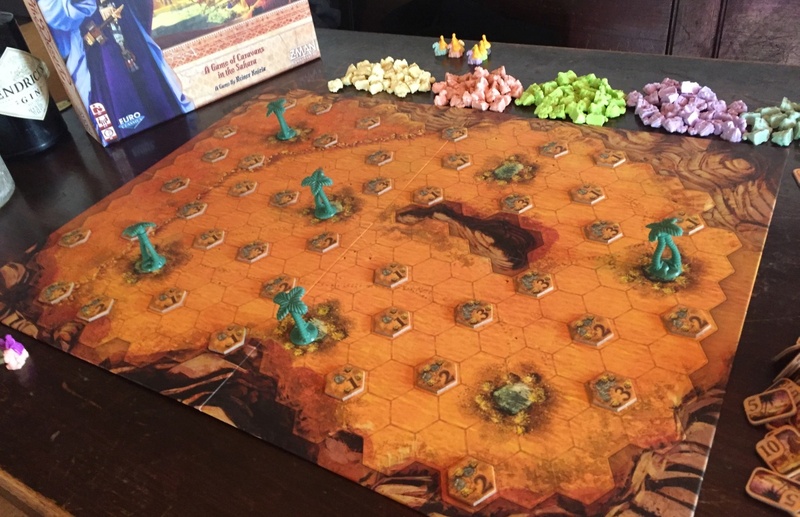 Like a cerebral Hungry Hungry Hippos, players are able to extend their wickedly-placed caravans just an inch here and there, scooping up great handfuls of points. Oasis! Pond! Another oasis! Enclosure! And then almost imperceptibly, just after Thirsty Twerps has rewarded everybody with easy points and territory and left you wanting more, it sloooowly starts to lock into an agonising area control game. There’s a really nice design lesson in there: if you want players to put in work, you first need to make them care. The moment you start eyeing up resources that are a little further afield, you realise that this board is a minefield. Any player on any turn might launch out and grab the final parking space at an oasis, or slip past one of your “walls” and ruin EVERYTHING. 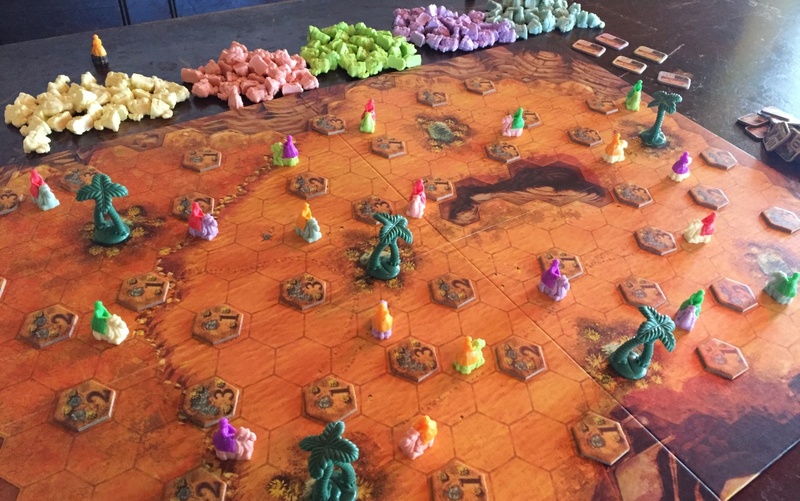 Worse, because two caravans of the same colour can’t even occupy adjacent hexes (because obviously that would fuse the two caravans in an abhorrent display of ludic inbreeding), an opponent placing just one camel near one of your like-coloured caravans can instantly bar you from three hexes. 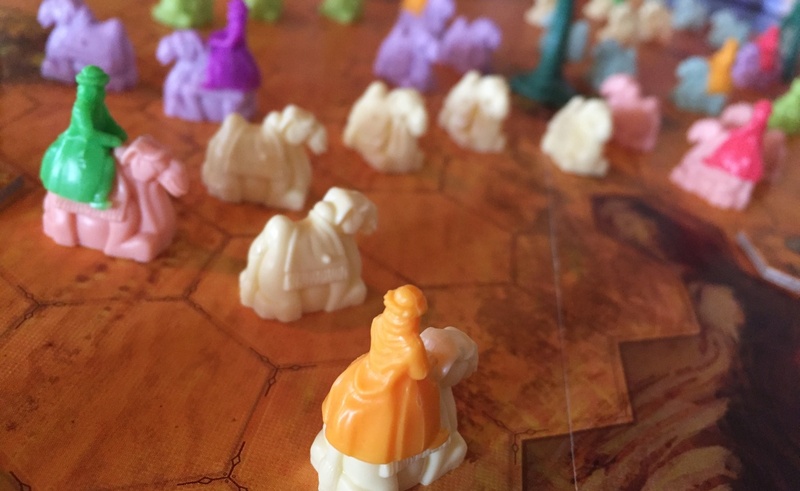 The camels might only be sweet little pastel-coloured pieces, but the design here means that placing them has incredible gravity, even moreso than in the phenomenally popular Ticket to Ride. This is what makes Thirsty Twerps such a clever game. 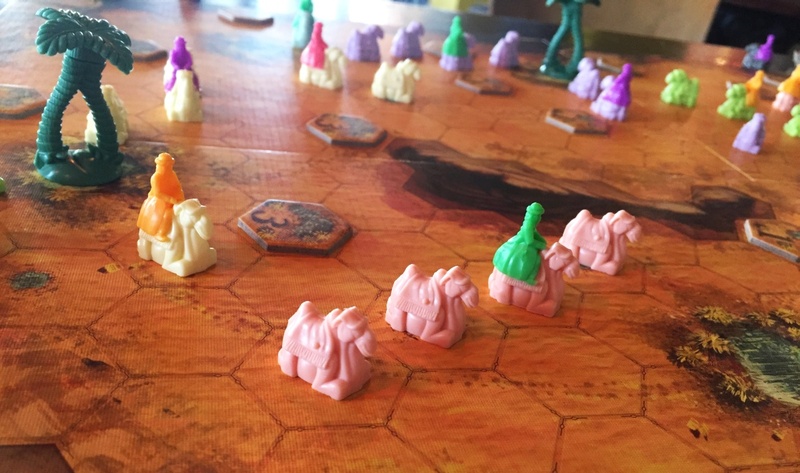 Players weigh up the ways they could get points, and then weigh that against the moves their opponents might make, and you know you’ve gotten this balance right when the claiming of a single space with a single teeny camel causes a calamitous cry of “F**K” from one of your opponents because they KNEW they should have claimed that LAST TURN and they DIDN’T. All of which makes Thirsty Twerps intelligent, but that’s different from what makes it fun. This is a contest with an amusingly human edge. Often you’re counting on players not noticing the hateful play you’re about to make, which means when they do notice and place the camel that blocks you, you can only grin. Did you really expect them to be that stupid? But for the most part, Through the Desert is fun because it encourages you to build castles out of sand, dreaming up plays that seem too good to be true, and then… you get away with them. Because guess what? Other players would like to block you, but mostly, they’re intent on completing their own schemes, and you’re only one opponent in a crowd. Your dreams literally come true: You can wall off a sixth of the board, or have an oasis all to yourself, or slurp down that three point water right next to your friend’s caravan leader. This is the heart of Through the Desert. It’s a game of fabulous tension, but where you mostly just watch your opponents block one another and feel like you’re getting away with murder (so long as you’re not playing it with just two people, at which point it becomes a lot colder). Similarly, in creating a playing area that’s cramped from the start it seems like THERE’S NO TIME, but the development of the board is actually pretty slow, allowing everyone to get tens and tens of points. It’s a design that manufactures incredible thirst, but also offers plenty of ice cold water. You can have a laugh at players batting the drink out of your hand, but you still get your fill. And yet you can’t drink yourself into exhaustion, either. Before you can even begin to get tired with all of this decision-making, Thirsty Twerps enters an unusually sedate final act. As if a sun was setting over your desert (or what really looks more like a packed hoofed mammal music festival) the points start to dry up. 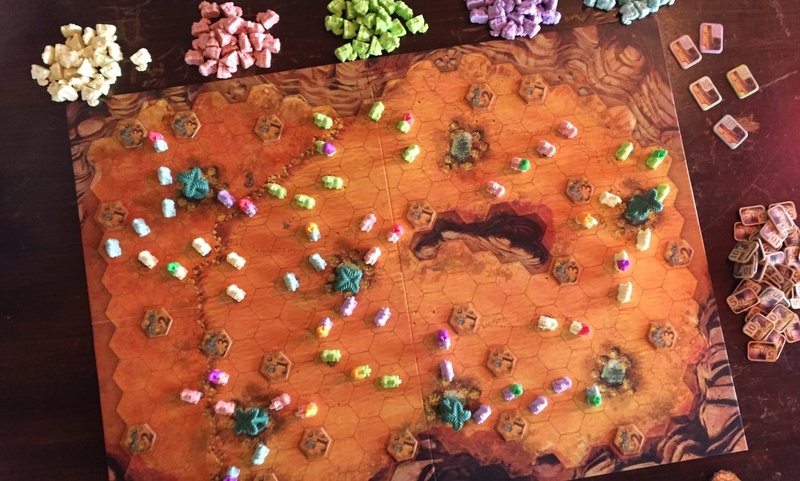 The stakes of play are lowered, and players idly work towards claiming the last few hexes left on the board. 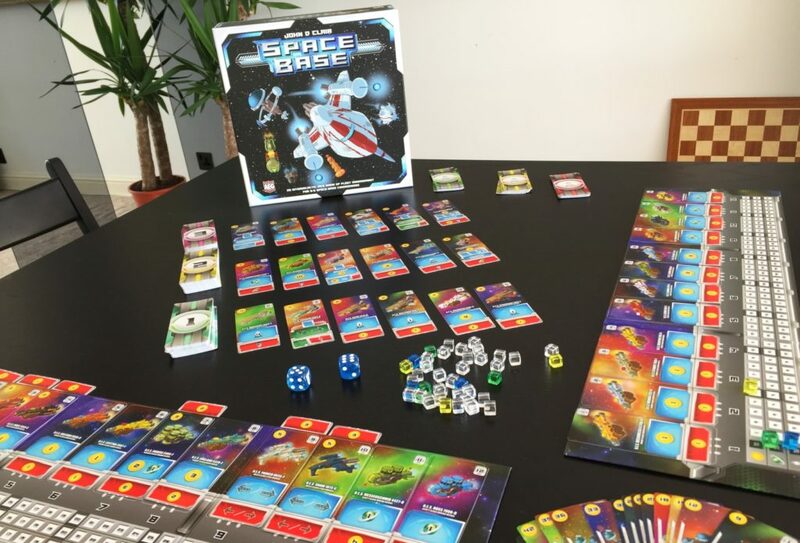 It’s an unusual structure for a board game, which tend to end with a bang as everyone sweats towards their goal, but here it works brilliantly. The relaxed pace of the first and last ten minutes mean that in my head, Thirsty Twerps is a chilled-out game, which makes me that much more likely to get it to the table. I remember it being easy-going, so I’m always excited to play it, but everyone ends up getting incredibly invested. There’s not a shadow of a doubt in my mind that this is in my favourite Knizia games ever, up there with the similarly soothing Ra and the nightmarish masterpiece of Tigris & Euphrates. 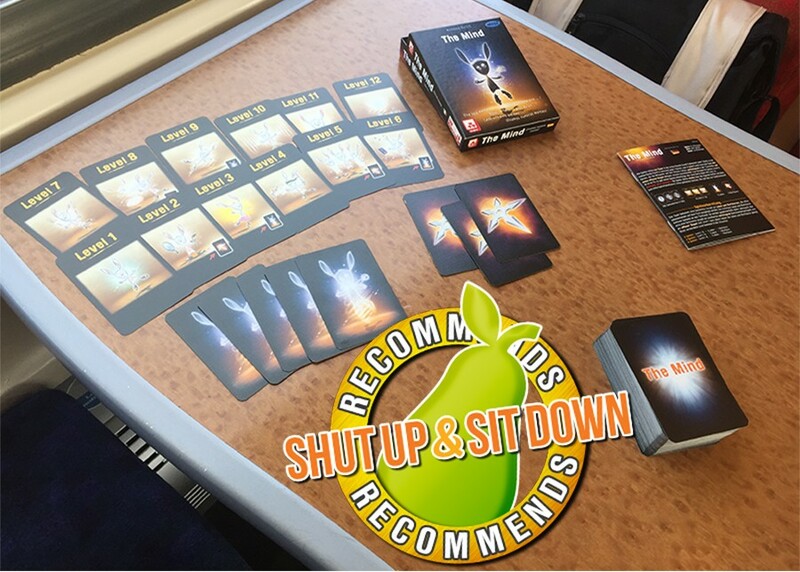 It’s the most similar to Samurai, if you’ve played that, but I think this is better, so it’s a no-brainer to say we recommend it wholeheartedly. 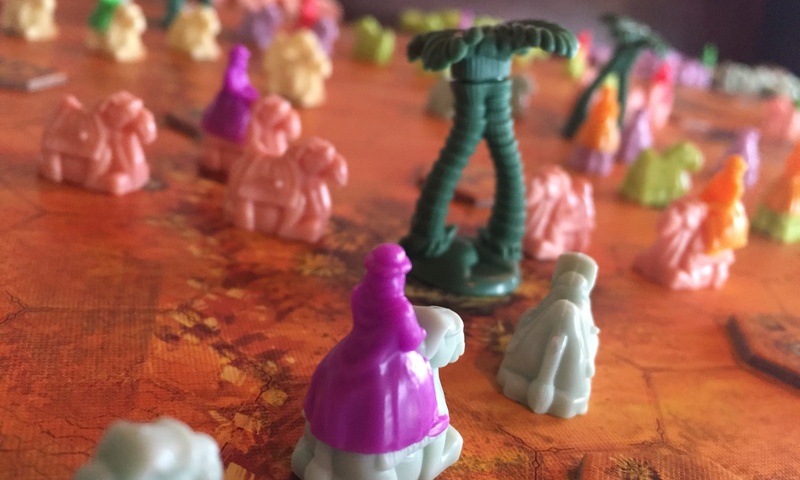 Generally speaking, board gamers always think they want more. 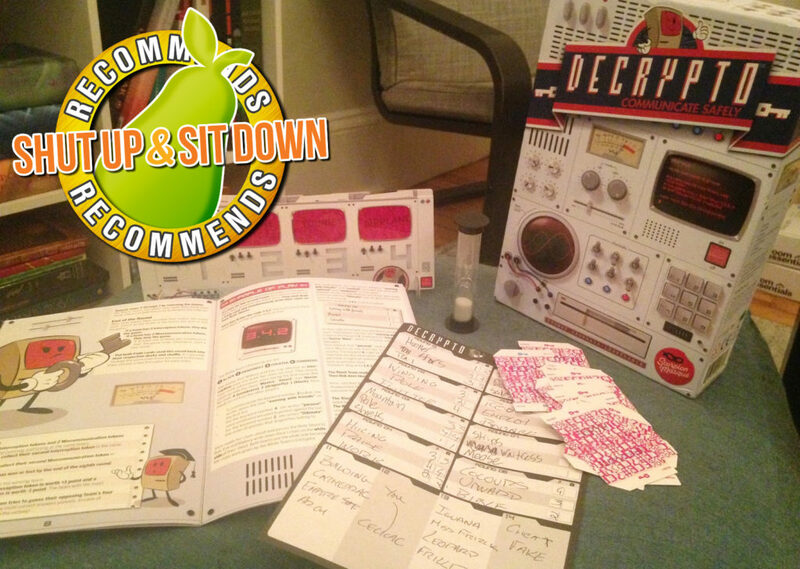 A bigger box, more stuff, a longer playtime, a more epic experience. But I think the most fun I’ve had this year was playing games like this or the fabulous Ethnos, where you can finish it with enough energy and time left to talk about how good it is. Then the game makes winners of you all.